Using a traditional flint and steel to light your fire is a fantastic skill to have and adds yet another dimension to your fire lighting repertoire. They’ve been used widely throughout Europe for thousands of years and there is also evidence of their use in the Middle East. We’re very fortunate to have an abundance of flint at our camp in Kent. 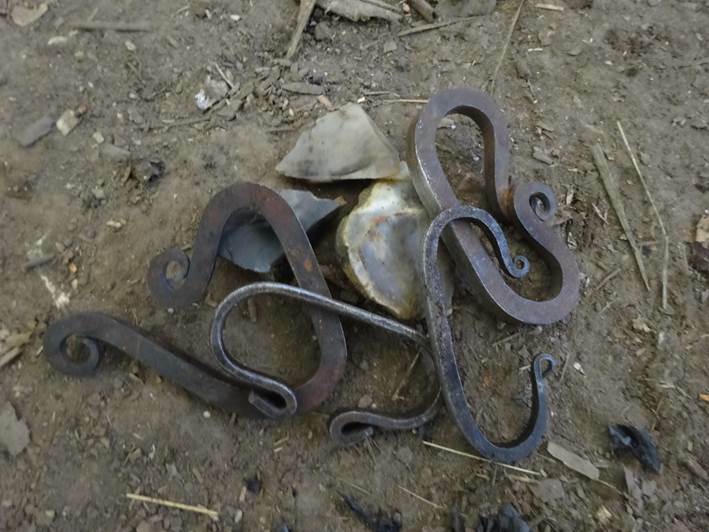 And we’re also fortunate that our blacksmith in residence, Ross of Kaos Blacksmiths, is able to make us fire steels in a wide variety of shapes and sizes. I generally use a flint and steel in conjunction with char cloth. You can see a video on how to make char cloth here. When it comes to using a flint and steel, you need to make sure that the flint has a sharp edge. You want to hold the flint in your non-dominant hand and use your thumb to hold the char cloth on top. Bring the firesteel down to cause a quick, glancing blow with the flint; you’re looking for speed rather than force. What’s happening is that as the steel makes contact with the flint, tiny pieces of the steel are sheered off. As they sheer off they are heated, and this is the spark that you see. Take a look at this video to get a better idea of how to use a traditional flint and steel..